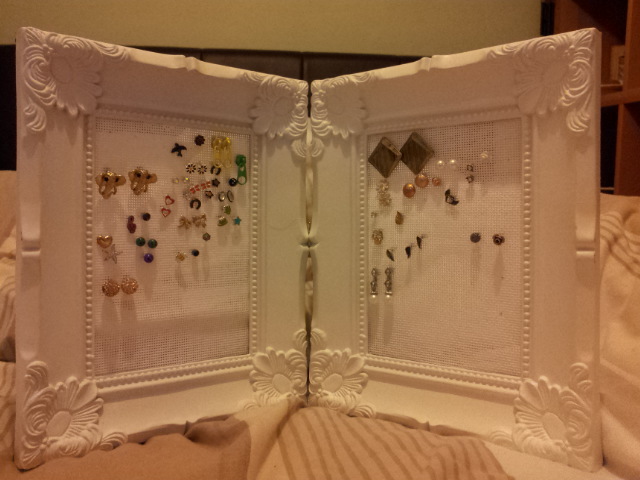 I don’t know about any of you but I love my earrings, mixing and matching for my many ear piercings. The only problem was that I was always losing them, or putting them down in a ‘safe place’ where apparently they disappear into oblivion (possibly the hoover) never to be seen again. So I figured the most logical thing to do is to get an earring holder, I looked around in few shops but if you’re a cheapskate like me I wasn’t prepared to pay £15 for a piece of pretty metal. So I decided to make my own. It was really simple actually, I found two cheap photo frames for a couple of quid and jazzed them up with some white spray paint. 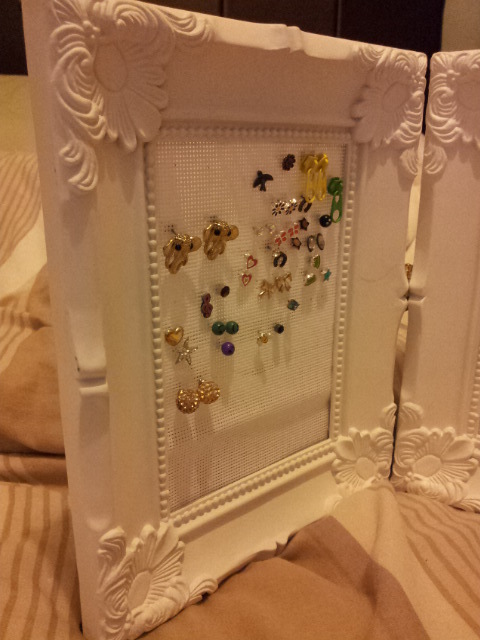 Then I used two small pieces of cross stitch material and stuck it to the back of the frames. I used an old hinge I had laying around as I tend to keep a lot of junk that may come in useful, attached it to the two frames and voila! You’re own personalised stud holder. Not too shabby I reckon, what do you think? I love this!!! Wish I were so crafty. I would make this for my granddaughter. Great idea!